How do we create emails that people love? We can all agree that email marketing is one of, if not the most effective digital marketing tactics. The problem is that most marketers and organizations have abused the channel; leading to depressed open, clickthrough, and post-conversion metrics, as well as a love/hate relationship with all emails. To solve this problem, we need to rethink how we connect with people via their inboxes, radically reduce the propensity of sending campaigns simply because our organizations have something to announce, and expand the KPIs that dictate success. Michael Barber presented on this topic in 2018 during a half day workshop to our local AMAWM Chapter. The presentation was an overwhelming success. As such we reach out to Michael and are grateful he offered his time to discuss this topic on our new podcast so we can all benefit from this knowledge any time and as often as we’d like. What has changed in the email marketing world since your 2018 AMA presentation? Some people think email is dead…is it? Or are we just not using it effectively? Has the shift in the social media landscape, including pay to play, limited organic reach, and all of the privacy issues impacted the way email marketing is used? Are marketers sending lower quantities of emails with higher quality content? How do we create an experience through email marketing? Building email for mobile – what are the key elements that make the mobile user experience seamless? How important is relative content? What tactics do you recommend for list generation? What methods build the most trust with your audiences? Is an immediate pop-up light box the best way to attract newsletter sign-ups? No. The prompt shouldn’t be given until there have been a few interactions with your website. How do the new laws (GDPR, CCPA) affect email marketing? Is there tension between personalization and privacy? What is the importance of sending emails from an ESP vs. your personal address? Don’t send from your personal address! What are the top B2C & B2B ESP providers? Have trends changed as far as the best time to send, subject lines, emojis, etc. 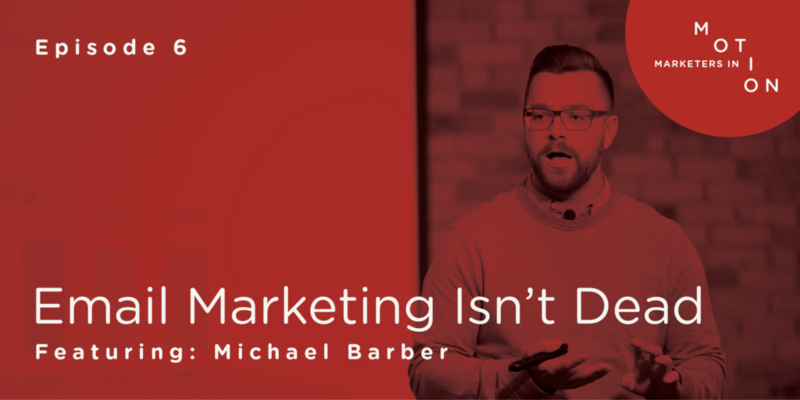 Michael always talks about reducing friction for the consumers – how important is this when designing emails? Why is it so hard for brands to do this? What is your overall goal? Conversions? Refer back to best design practices. Consider where eyes will focus. What do we do after the behavior? Email marketing isn’t just writing copy and hitting send. What process do you take when designing an email campaign? Progressive Insurance has a 35-step detailed process. Michael had the name or resource link. Follow up with him for it. Pinterest & others are creating emails that are like microsites with dynamic content, video, etc. Microsegmentation and real-time personalization can be driven by predictive analytics, but how can small companies achieve this level of personalization without the tools (AI) to do this? Why don’t brands get to know their subscribers and their behaviors? With the tools we have out our disposal we can do this!